Camping les Charmilles is a small, quiet and peaceful campsite that lies within 5 hectares of grounds along the southern edge of the Coiron massif within the Auzon Valley. The campsite is pleasantly landscaped with terrace pitches offering views across the valley and the Tanargue massif. A fence surrounds the campsite so that children are able to roam safely whilst playing in the extensive grounds. Camping les Charmilles is especially well suited to those younger families not only due to its small nature but also due to the extensive range of family activities that are on offer. In high season the campsites animation team puts on a variety of games and activities and there’s also an extensive entertainments program in the evenings. The Ardeche region of France is extremely well known for the variety of sporting activities that are available. Camping les Charmilles is well placed to take advantage of the great range of activities such as hiking, cycling, mountain biking, climbing, canyoning, canoeing and much, much more. 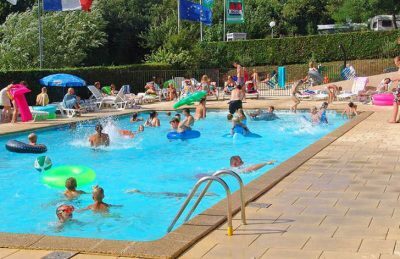 One of the great things about Camping les Charmilles is its lovely swimming pool area. Offering views over the surrounding valley and mountains, the swimming pool is a fantastic place to sit back and relax whilst the children are having fun. There’s a heated swimming pool and also a toddlers pool, both of which have sun terraces and loungers where the sun obsessed can soak up the hot summer sun. Camping les Charmilles is a lovely small family campsite that despite of its size still offers a great range of on site activities and facilities. On site activities at Camping les Charmilles include multi sports field, tennis court, table tennis, boules, cycle routes and playgrounds. Facilities available at Camping les Charmilles include WIFI, restaurant, snack bar, takeaway, bar, pizzeria, groceries, animation team, games room, tv room, washers and dryers. Accommodation at Camping les Charmilles includes a range of tents that are available from Suncamp.